Posted January 13th, 2019 by Guild & filed under Industry information. ARE you aware that trade partners are given free-of-charge advertising on the website of the Guild of Master Chimney Sweeps? This is no gimmick but a real offer to exhibiting companies at the Guild show either last year (2018) or for the forthcoming event this March, 2019. We just wanted to provide a courtesy marketing platform as a way of thanking trade partners for their ongoing support to the Guild. “We all know that most things in life come at a price,” said Lawson Wight, chairman of the Guild. “But we have built some solid relationships with trade partners over the years and we wanted to give something back. Trade Partners are able to personally manage the company’s individual sub page and make changes – offers for example – when needed or they can contact the Guild web services providers for help. The website for the Guild of Master Chimney Sweeps is popular and our members are interested in the latest technology and any other services, which will enhance his or her work. 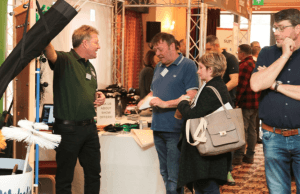 We promote the Trade Partners page to members too, especially in the run-up to the annual trade show. To find out more about this fantastic opportunity, contact Jez Brooks by email: jez@cb2creative.com or phone: 01223 750 565.